GST Sugam Return - Overview, Format, How & When to File? Under the GST regime, there has been a significant increase in the number of taxpayers & consequently the number of returns filed has also gone up. In the 27th GST Council Meeting, the Government announced that a simplified GST returns (Sahaj & Sugam) filing mechanism would be introduced for taxpayers with a turnover below Rs. 5 crores. These returns would require lesser information to be declared as when compared to a regular taxpayer. The new system will be implemented from 1st April 2019.
Who can file GSTR SUGAM? What are the contents of GSTR SUGAM? When must GST SUGAM be filed? How to differentiate between SUGAM, SAHAJ and Quarterly returns? 1. What is GSTR SUGAM? GST Sugam is a proposed simplified returns form which is to be introduced by the GST Council in April 2019. A taxpayer with a turnover of up to Rs. 5 crores in the financial year will get an option to file this return. This form will be made available to only those small taxpayers engaged in both B2B (Business to Business – supplies to GST registered persons), and B2C (Business to Consumer – supplies to consumers and unregistered persons under GST) supplies in India. In the 28th GST council meeting, members approved quarterly GST returns (Sahaj & Sugam) filing for small taxpayers with a turnover of up to Rs.5 crores (as against the initial limit of Rs.1.5 crores). However, the tax is to be paid monthly via a challan. 2. Who can file GSTR SUGAM? Small taxpayers with a turnover of up to Rs 5 crores and engaged in both B2B and B2C supplies can opt for the GSTR SUGAM form to file their quarterly returns. 3. What are the contents of GSTR SUGAM? a. Basic details (auto-populated) – Contains GSTIN, Legal Name, Trade Name, etc. of the taxpayer. b. Details of outward supplies made to registered persons, consumers and un-registered persons (B2C & B2B) and inwards supplies attracting reverse charge – Here, the total taxable value and tax payable on outward supplies and inward supplies attracting reverse charge respectively have to be mentioned separately. i. The annexure shall be uploaded before filing the return for any tax period. ii. Details of the invoices relating to outward supplies made to registered persons (B2B) can be uploaded in real-time during the quarter. iii. Supplies other than those made to consumers and unregistered persons (B2C) and registered persons (B2B) in the domestic market cannot be made through this annexure. iv. Those who have transactions in the international market will file the annexure for quarterly returns. v. This annexure can also be used to report debit and credit notes relating to supplies made to registered persons (B2B). vi. At least, a four-digit level reporting of HSN code will be mandatory. b. Summary of Supplies made and tax liability – This data will be auto-populated from the ‘Annexure of Supplies’ to return. 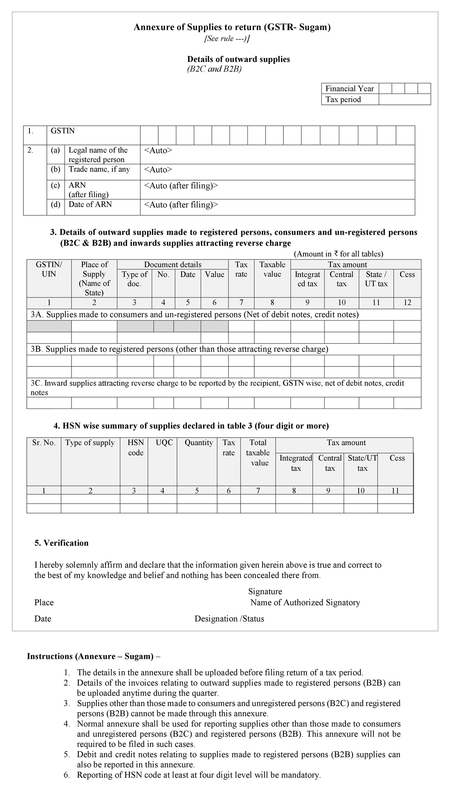 c. Summary of inward supplies for claiming input tax credit (Auto-populated) – This section reveals auto-populated information relating to ITC on Inward supplies (attracting the reverse charge, other than those attracting the reverse charge, supplies rejected by the recipient) and debit notes received from supplies & credit notes issued to customers. d. Interest and late fee liability details – Late fee on account of late filing of returns shall be entered in this section. e. Payment of tax details – Includes details of tax to be paid under different heads such as CGST, SGST, IGST. Tax paid through ITC or cash. i. A taxpayer who has made supplies to consumers and un-registered persons (B2C) and to registered persons (B2B) in the domestic market only can file this return. ii. Input tax credit availed earlier during the first two months of the quarter will be adjusted from the claim. If the balance of claim turns out to be negative, then it will be added to the liability for the same quarter. iii. Tax paid during the first two months of the quarter will be adjusted against the total liability of the quarter. iv. Payment can be made out of cash or credit as per rules. v. Reversal of credit under rule 37, 39, 42 & 43 shall be reported as net of reclaimed ITC if any. Ineligible credit shall also be reported under reversal. vi. Adjustment in ITC, if any due to transition from the composition scheme or otherwise shall be reported in table 4. The recipients from these small taxpayers can avail input tax credit based on the invoice uploaded by the supplier and therefore, the small taxpayers would be given online facility to continuously upload and view invoices on a daily basis. The invoices uploaded by 10th of the following month would be available as input tax credit to the recipient in the relevant month similar to a large taxpayer who file monthly returns. 5. When must GST SUGAM be filed? GSTR Sugam shall be filed quarterly. But the taxpayer has to pay tax monthly. 6. How to differentiate between SUGAM, SAHAJ and Quarterly returns? This is not a predetermined profile but a taxpayer will have the option to create a profile to file through this return. Sugam is a predetermined profile of the quarterly return. Applicable to small taxpayers making only B2C supplies in the domestic market. Applicable to small taxpayers making supplies only to consumers and other businesses (B2C and B2B) in the domestic market Applicable to small taxpayers making exports, imports, supplies to B2C, B2B, SEZ, etc. Sahaj is a predetermined profile of the quarterly return.